Press Pass LA sat down with four of the producers and screenwriters of Arrival to get some insider information about the making of this film, which hit theaters November 11th. The producers Dan Levine, Aaron Ryder, David Linde along with screenwriter Eric Heisserer shared some lively moments leading up to the film’s exciting release. PPLA: How did it all get started? Dan Levine: I am a producer but I am also the President of 21 Laps, which is Shawn Levy’s company. We had a meeting with Eric Heisserer, who is a writer we really admired. He was mostly writing Horror at the time. We spent two hours with him trying to find ideas and he said no to everything. On his way out, I said to him “is there anything you like?” And he said there’s a book of short stories by this unknown Sci-Fi writer named Ted Chiang you should check out. Eric Heisserer: I had been a fan of Ted Chiang’s work for a number of years. I found a short story of his called Understand that a friend of mine sent. I loved it so much. I was like, what else has this guy done? I found a collection of short stories on Amazon, bought it and it showed up two days later. Then I sat down, thinking I am just going to read the first story. Then three hours later, I got to Story of Your Life, that’s when I had to stop, put it down and go out and hug my wife. It had such a profound emotional effect on me. And I then realized this is what I wanted to share with an audience, not really how cinematic it was, but really how these made me feel and if there’s a way I can gently lift it from the source material and find a way to translate that to film. Then I would be a lucky dog. Dan Levine: I had never heard of Ted. We read the book Story of Your Life, which was the original title was. A jaw dropper, most amazing short story, not just emotionally as you could see in the film but a bombshell. I said I hope this is available, I hope no one has the rights to this. We found the short story because Eric brought it to us, he was always attached to write it. Aaron Ryder: Why hadn’t Ted Chiang’s any of his stories been made into a film yet. That was my bigger surprise. I’ll be honest with you Dan Levine and Dan Cohen at 21 Laps did a lot of the heavy lifting in developing the story and developing the script. So it came to Film Nation at a slightly later step in the process. And if you think about some great science fiction films of the past, you think of Close Encounters, Contact, Alien or Blade Runner it’s hard standing in the shadows of these great films but you haven’t felt or seen a science fiction film that had an emotional component to in quite some time. 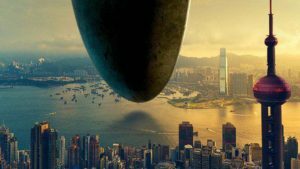 PPLA: What makes Arrival different from other Science Fiction films? Aaron Ryder: Arrival is one of the most exciting films I have ever been involved in to be honest with you. Here’s what’s exciting about it. It feels perfect for right now. It’s a movie about communication in an era where it’s complicated right now in a complicated world about communication and miscommunication. That’s perfect for right now. And like any good science fiction, it should be a reflection of what’s happening in society. When we read the script and got involved with it. It just felt very timely. You can watch the film when it comes out in theaters November 11t, 2016.